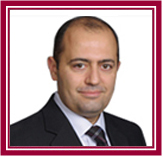 Dr. Mohammad Hajjar attended the University of Aleppo College of Medicine in Aleppo, Syria. Dr. Hajjar completed his internship and residency at the University of Aleppo and the University of Tennessee. His fellowship in Cardiology was at Michigan State University and his fellowship in Interventional Cardiology was completed at the University of Texas Medical Branch in Galveston. He was a hospitalist in Tennessee at Regional Medical Center in Memphis, Baptist Memorial Hospital in Union City, and Methodist University Hospital in Memphis. He served as an assistant professor at the Department of Medicine at Michigan State University. Dr. Hajjar now serves patients at his private practice with Dr. Zarka in Garden Grove and Santa Ana.